The eight ancestor is my 52 week challenge is my wife’s paternal great-grandmother, Anna (HUIZEL) COLLINS. I’m not completely sure of the pronunciation of that surname, but I’ve heard both Oot-zuhl and Ooh-zuhl. Anna was born around July 1881 in what is today, Netolice in the Prachatice District, South Bohemian Region of the Czech Republic. 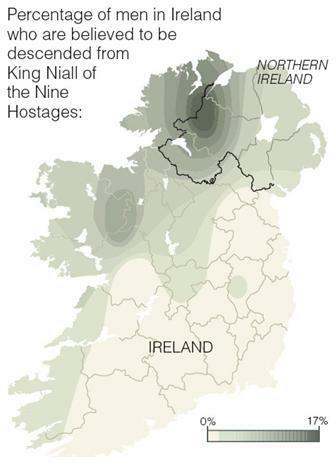 In 1881, I think this was just considered Bohemia. Her parents are John HUIZEL and Barbara REINDL. There is no birth record that we have found, yet, but I did find records of her parent’s marriage and the births of some of her other siblings in the area. 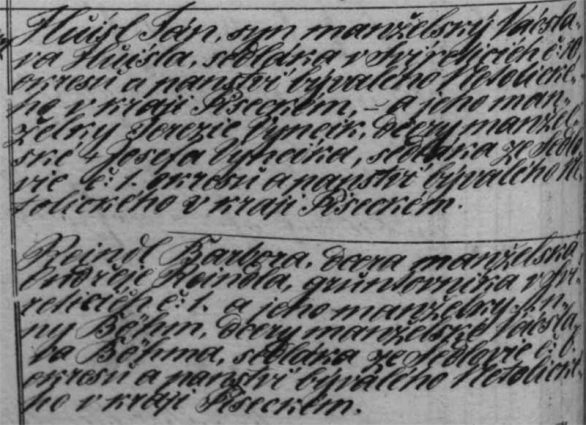 I basically tripped into the Czech records one day while browsing FamilySearch. I found a lot of info on her family at the online records available at the State Regional Archives Trebon. 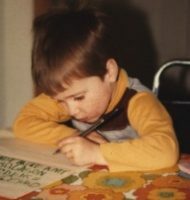 I got a lot of help from a very well-done blog about Czech Genealogy. You can read more about what I found on a post I wrote about it. Anna immigrated from Bohemia around 1885-1888 with her parents. 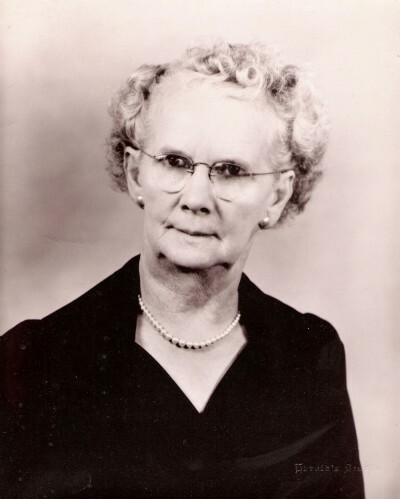 On Valentine’s Day 1899, she married Albert COLLINS in Cerro Gordo County, Iowa, where her parents resided. Albert and Anna had four children, including my wife’s grandmother, Barbara. Albert passed away around 1945 and Anna lived on in Madison, Wisconsin until she passed away in 1945. She is buried with her husband in Boscobel, Grant County, Wisconsin, where they lived for many years. This post is 8 of 52 in the “52 Ancestors in 52 Weeks” Challenge” begun by Amy Johnson Crow. 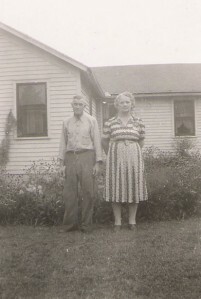 This is a photo of my wife’s great-grandparent’s Albert & Anna (HUIZEL) COLLINS. Albert was born in Wisconsin and Anan was born in Czechoslovakia. 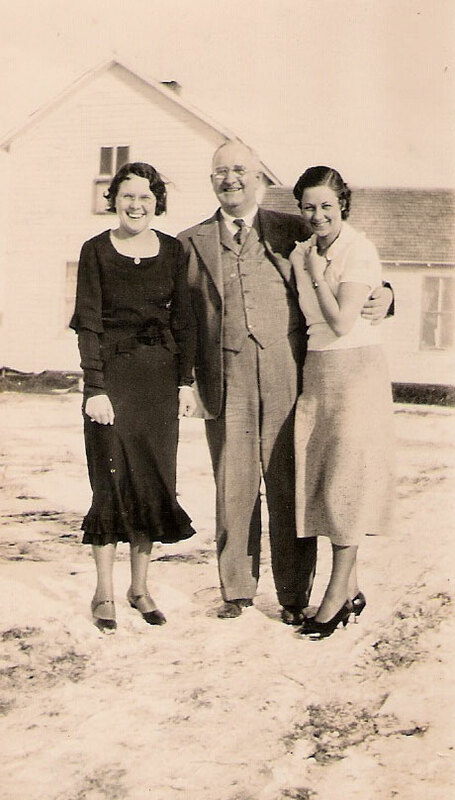 This is a photo of Jacob HUIZEL (middle) and two unknown women. Jacob is my wife’s great-great uncle. The reason for the “One-Arm” title is that we found an earlier photo of Jacob and on the back it just said “Uncle Jake” and under it was written “(one arm)”. There are a few photos like this one, but it’s always hard to tell if he does only have one arm. If I would take a guess, it would be his right arm since you can see his left one. Family mysteries, huh?